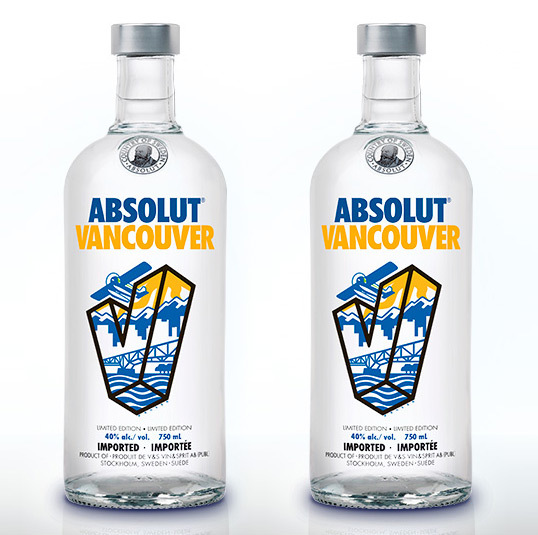 Absolut will be donating up to $120,000 towards the Vancouver arts community through proceeds from the sale of this new limited edition bottle. Local artist Douglas Fraser shares his rationale behind the design. Wonderful! I’m a friend of Doug’s and always love seeing his work out in the wild. Love this tribute to the 2010 Winter Olympics in Vancouver. It’s my hometown so I have to give it a shout out!! If you look really close you’ll see “F R A S E R” at the bottom of the V. And if you go to http://www.AbsolutVancouver.ca, you can vote for one of five finalists who will receive $120k towards an Absolut Vancouver art project. I’m one of the happy finalists!